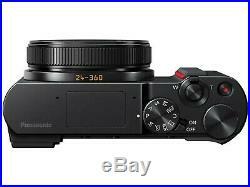 Panasonic Lumix DC -TZ200 compact camera (BLACK) with hard leather case. Excellent condition, hardly taken out of the box. 1-inch 20MP MOS Sensor And Powerful 15x Optical Zoom, High Performance LVF For Ultra Telephoto ShootingUltra High-definition 4K Video And 4K PHOTOHigh-speed, High-precision Auto Focus And FastResponseBluetooth 4.2 And Wi-Fi 2.4GHz, 3cm Macro ShootingPanasonic DCTZ200 compact camera, finished in black and featuring a massive 15x optical zoom (24-360mm). A Leica DC Vario-Elmar lens and 20.1 megapixel 1 high sensitivity MOS sensor capture your precious moments in incredible quality, whilst being housed in a body small enough to slip into a pocket. Panasonic's Venus Engine image processing system helps ensure stunning, noise-free images - even in tricky low light conditions. It's even easy to compose your shots - choose whether to use the live viewfinder or the 3 screen. The DCTZ200 can shoot amazing 4K video - so you can treasure your memories in four times the quality of Full HD. You can also shoot still photos in amazingly detailed 4K, thanks to the Lumix 4K photo mode. The DCTZ200 will also make sure that you don't miss a single moment, no matter how fast paced the action - the new ultra high speed focussing mode locks onto your chosen subject thanks to its clever "Depth From Defocus" (DFD) technology - offering a shooting time noticeably faster than traditional light speed autofocus systems. A range of creative controls allow you to edit your pictures in-camera. From basic filters to black and white shots with artistic single colour selection, the DCTZ200 allows you to create unique and beautiful effects without the need for external software. Built-in Wi-Fi and Bluetooth allows you to wirelessly send photos and movies to linked smartphones and tablets for direct sharing online. 4K Photo Auto Marking automatically detects motion on a subject's face and sets a marker, allowing you to quickly skip to that sequence when selecting shots. Monochrome mode in Photo Style simulates black and white film, creating impressive monochrome pictures with deep blacks and rich gradations. In-camera raw file processing is possible, allowing you to adjust color space, white balance, exposure compensation, highlights/shadows, saturation, noise reduction, sharpness, and many other settings. The included rechargeable lithium-ion battery provides you with 370 shots per charge when working with the rear LCD, or 350 pictures with the electronic viewfinder when set to the eco 30fps setting. The item "Panasonic Lumix DC -TZ200 compact camera (BLACK) with hard leather case" is in sale since Monday, February 18, 2019. This item is in the category "Cameras & Photography\Camera & Photo Accessories\Cases, Bags & Covers". The seller is "harry-jorda" and is located in St. This item can be shipped to United Kingdom, Austria, Belgium, Bulgaria, Croatia, Cyprus, Czech republic, Denmark, Estonia, Finland, France, Germany, Greece, Hungary, Ireland, Italy, Latvia, Lithuania, Luxembourg, Malta, Netherlands, Poland, Portugal, Romania, Slovakia, Slovenia, Spain, Sweden, Australia, United States, Canada, Brazil, Japan, New Zealand, China, Israel, Hong Kong, Norway, Indonesia, Malaysia, Mexico, Singapore, South Korea, Switzerland, Taiwan, Thailand, Chile.